Oklahoma City Thunder point guard Russell Westbrook has started the 2016-2017 season at a historically productive rate. Westbrook has posted triple-doubles in five of his first fourteen games and is averaging 31.6 points, 10.4 assists and 9.6 rebounds per game on the year. In addition to his impressive numbers, the Thunder have opened the season with a 8-6 record. Westbrook is the first player to post a triple-double in two of his first three games since Magic Johnson in the 1982-83 season. Magic Johnson and Oscar Robertson both achieved this feat twice, and Jerry Lucas accomplished this once. Westbrook is no stranger to triple-doubles. He led the NBA with 18 triple-doubles last season, which tied him with Magic Johnson for the most in the past 40 seasons. He is also the first player in league history to open a season with 100 points, 30 rebounds and 30 assists in the first three games of a season. When asked by Royce Young of ESPN.com about his playing style earlier this month, Westbrook said, “I play every game like it’s my last,” which explains his energetic play. With Kevin Durant’s decision to leave the Thunder this past summer in free agency, numerous basketball analysts expected Westbrook to be in the middle of the MVP discussion due to his ability and tendency to stuff stat sheets. Oscar Robertson, the only player to average a triple double for an entire season when he was a member of the Cincinnati Royals in 1961-62, said via Brett Dawson of the The Oklahoman in October that Westbrook “has all the tools” to average a triple-double. Westbrook averaged 23.5 points, 10.4 assists and 7.8 rebounds per game last season and, after losing Durant, the Thunder quickly realized that Westbrook was invaluable, rewarding him with a 3-year, $85 million extension. 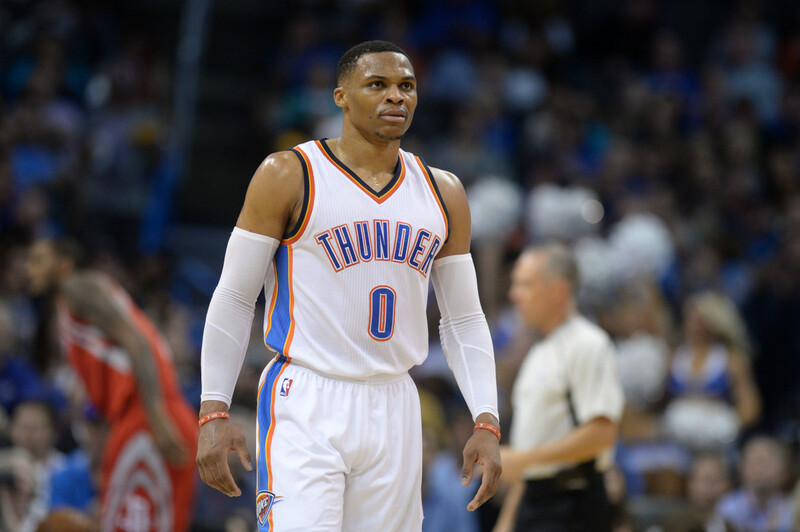 As a point guard, he is in the middle of everything the Thunder does offensively, and they have chosen to build around his unique talents. The team traded for Oladipo, who is the best shooting guard the Thunder have had since Rockets’ star guard James Harden and, together, the tandem of Westbrook and Oladipo forms one of the most athletic backcourt duos in the entire league. CBSSports.com reported on November 21 that Westbrook has 42 career triple-doubles and needs two more to pass LeBron James, who is sixth, on the all-time list. If Westbrook is able to sustain his incredible production, he may not only pass Larry Bird (59) for fifth all-time but he may also join “The Big O” as the only players to average a triple-double for an entire NBA season.